So you don't believe in feng shui? So you think it's all crappy nonsense? So you have tried my Feng Shui Test and did not see any results? If you have read my post on feng shui, you would know that I had asked all you sceptics to do the exact opposite of what you are supposed to do in terms of good feng shui. That means, if sleeping with your head pointed to the East is bad for you, then you purposely sleep in this direction for a week or more. When you start to experience bad luck or bad events in your life, you quickly switch back to practising good feng shui to reverse the effects. Which simply means, if North is your good direction, then start sleeping with your head pointed to this direction. Now, there may be some of you who tried the test and did not experience anything unlucky or bad. Perhaps the effects were not strong enough. And probably that's why you did not even notice anything bad happening to you. Well, I've some good news for you. Today, I'm going to introduce you to another test, a more powerful one which I shall call The Ultimate Feng Shui Test. I got this idea after attending Lillian Too's Feng Shui Extravaganza on 11th January 2009 held at the KL Convention Centre. 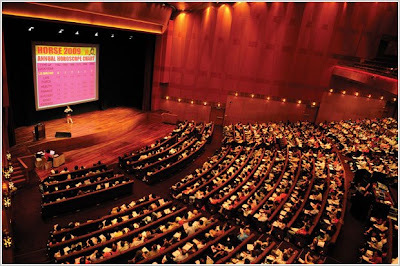 There are currently two famous feng shui practitioners in Malaysia. Both command their own followers and legions of fans. Both are also famous feng shui authors and teach feng shui to people in Malaysia and all over the world. They are none other than Lillian Too and Joey Yap. To be honest, I prefer Joey Yap as I find his teachings to be more focused on classical feng shui, whereas Lillian Too is more commercialised, with emphasis on new age feng shui. However, Joey Yap's Feng Shui & Astrology Seminar was held on 17th January 2009, which was a Saturday. I was not free as I was working on Saturday. So I settled for Lillian Too's whole day seminar which was held on a Sunday. My brother went for Joey Yap's seminar so I will gather some information from him and post it on my blog here later. If you can't wait, you can read more at Eiling's blog. As to what Lillian Too talked about in her seminar, I will be posting that in my next post. Meantime, let's get back to my Ultimate Feng Shui Test. In feng shui, there are 3 sectors in your home that you must be aware of. 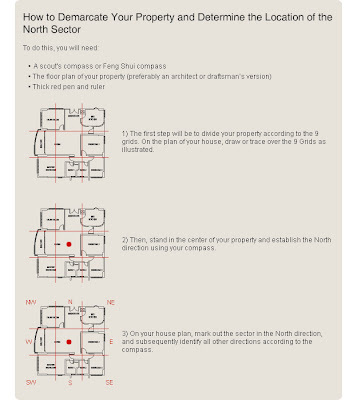 In 2009, and starting specifically on the 4th February 2009, although the effect can start earlier, take note of the following sectors in your homes. North - The Five Yellow (Wu Wang) affliction star flies into this sector this year. In Hong Kong, people are very afraid of this star. It is said to bring misfortune, bad luck, illness and even death. If your bedroom is in the North sector of your house, then you will be badly affected. The best way to avoid this is to move out of that room! However, if you can't, make sure you do not knock, dig, renovate or make lots of noise in this room or you will activate the Five Yellow. North East - The Grand Duke Jupiter (Tai Sui) will be residing in this sector this year. Do not sit facing North East as doing so will bring you misfortunes and bad luck. If you work in your office, make sure you are not sitting facing North East. Also, digging the ground, cutting a healthy tree and renovating at this sector will bring about the same effects. However, sitting with your back facing North East will be good as you are said to have good support from The Grand Duke Jupiter. East - The Three Killings (Saam Saat) will be in this sector this year. Do not sit with the Three Killings behind you. Instead, confront it by facing East. Otherwise, you will suffer from loss of wealth, loss of loved ones and loss of good name. To be sure you get the correct direction, make sure you use a good compass. Stand in the middle of your house to get the accurate direction with your compass. Now that you are clear about these afflictions, this is what you do to prove that feng shui works, which is to do the exact opposite of the above. 1. Make the North sector of your home your bedroom. Make as much noise as you can in this room (example: play the radio as loud as you like!) Or knock on the walls to hang some pictures! Or if you have a garden in the North part of your house, do some digging or even better, start renovating here! 2. Work and sit facing North East (Grand Duke Jupiter) everyday. Or start renovating in this sector of your house! 3. Sit facing West (Three Killings behind you) everyday, especially at work. Obviously, if you sit facing North East (Test No.2) , you won't be facing West (Test No.3) but why not do both like sitting facing North East in your office and facing West in your house? Combining these three afflictions can be deadly. I really have no idea how deadly as I do not dare to try! But for sceptics, you are welcome to give this test a try. Let me know the results please, that is, if you are still alive! haha now I've found someone whom is interested in Feng Shui too! Cheers! Renovating the house is a hassle. Changing sitting direction in office is even tougher, as I am not the boss. How about using crystal, mirror or some other things to ward off bad luck? I usually sleep with my head facing North, so I try sleeping with my head facing South. However, my spouse don't believe in Fung Shui and continue to sleep in the opposite direction, now I get to smell stinky feet all night. Also Chinese believe only the dead sleep with their feet facing the door. So if you wake up hearing Angels singing dont worry you are already dead!!! eiling, I'm really quite surprised you are into feng shui as well. I started going into this after some personal experiences which made me into a believer of this ancient art. khengsiong, you are absolutely right. Renovating is a hassle, so I don't do it. But because CNY is coming, I took the opportunity to rearrange all my furnitures! Must stimulate the chi for the new year, you know? Lucky you Foong, you were able to attend this seminar. I'm looking forward to your posts about Feng Shui. Like I said, I believe in it. What about the different items sold to counteract bad energy or those that is supposed to bring good luck, do you think these work? Btw, I agree with you about Lilian Too. I bought one of her books online and was disappointed. It looks more like a design book than a Feng Shui book. I'll have to look into Joey Yap. Does he have a website? gallivanter, then you are the perfect candidate to try my Ultimate Feng Shui Test! Muahaha! A lot of things cannot be explained by science. For example, you have not seen a ghost, does it mean they don't exist? I can make the pendulum move with my mind - science have no answer for that! "The Secret" as popularised by Rhonda Byrne and "The Law Of Attraction" cannot yet be fully explained by science. People who practises Tai Chi and Chi Kung benefit healthwise just by doing proper breathing and moving their hands and feet. Science have no proper explanation for that too! You can receive a call on your mobile phone even though you can't see the radio waves in the air connecting the caller to your phone. Just because you don't see those invisible waves, does not mean they don't exist! So are you going to be rich this coming Year of the Ox? Looking forward to what you learned at Lilian Too's talk as well as Joey Yap's from your brother, Foong. babette, according to Lillian Too, those objects work. According to Joey Yap, they are useless most of the time! So, who to believe? Well, personally I believe those objects do work IF you believe in them. And it's really not the object but your mind that makes it work. You see, some people who are Christians are uncomfortable using those Chinese God statues as feng shui objects. So they can actually substitute with a cross or maybe a statue of Mother Mary or Jesus Christ - anything that make their minds link to the objects. This is really...interesting. Even though I'm lazy about details, but really, your feng shui posts are prompting me to read more about feng shui more. I personally think I can control my own destiny but no harm reading it I believe. lisalicious, yes I agree Lillian is too commercialised, but she's damn good at marketing! Joey Yap doesn't sell any products, so I trust his words more. And he's more into classical feng shui, not new age feng shui where you need to place objects to cure feng shui problems. jim, yes you can control your destiny, but certain things are already fixed at birth and cannot be changed. You can however improve it using your hard work and some help from feng shui. it seems that more and more people believe in feng shui techniques of channeling positive energies to enhance fortune and health. A new year means a new feng shui position. Science, sometime is lagging behind in explaining things. Just like during our ancestors' time, they thought natural disasters are signs from God, or Sun is God, of Fire is a magical thing, which then must be also God. It's human nature to fill the void of unexplainable with 'something'. But now we know the story as we advanced forward. So to say, 'some things can't be explained by science, it must be due to certain magic, mysterious, unexplained forces bla bla bla (insert any supposition to fill the void)' is not entirely right. Just NOT YET can be explained. Have faith in science, LOL! Good things that help you live a better, happier life, I have nothing against it. Only when it becomes an obsession, or involving ridiculous rituals (explanations not needed because 'not everything can be explained') then I am against it. Feng shui, most of it is common sense - lighting, ventilation etc. The science part came latter to explain the 'reasons' behind those actions. I prefer Joey Yap over Lilian Too. ps: Sorry for the long rambling. This is to make up for the missing comments over my hiatus period in this blog haha! Feng shui is always mysterious to me. I have studied some simple guides of Feng Shui, But didn't obey all of them. I know some Taoists who know Feng shui well, But I think they are too commercial already. In the Philippines, we do believe in Feng shui - well my family atleast. There's no harm in trying to be safe. yeah meet up at his seminar next year! This is very interesting but I am a little confused. I want to do the Feng Shuit so I am going to read this again. Great info! Wah... so many people packed at her seminar! Now, you do sound like a feng sui guru too, where is your seminar held? Agree, Joey Yap fung shui is more practical. I like to look at Fung Shui in a scientific way! It works! life ramblings, yes lots of people believe in feng shui and use it to enhance their wealth and health. Since feng shui is dynamic and ever changing, we need to update every year. The good position last year may turn bad this year, hence the need for updating our feng shui. You are right - should have more faith in science. All these ghosts, unexplained phenomena and feng shui can possibly be explained by science in the future.We are probably not advanced enough yet, the aliens are probably laughing at us thinking how backward we are. That's one reason why they don't reveal themselves yet cos we'll think they are Gods! As for the deja vu thing, maybe we are in the Matrix! LOL! I also prefer Joey Yap - I think he talk more sense although his talk is not as entertaining as Lillian Too's. hehe foong, i don't believe in feng shui but when buying a house this thing is most important! lol. you know why.